It’s no surprise that traditional design and refined watchmaking take the center stage at any large-scale watch event. After all, our reverence for beautiful timepieces begins with an understanding of the centuries-old history of fine watchmaking–including all its traditional designs and materials. Yet many watchmakers have built their reputations with a more contemporary interpretation of those traditions. Most of these brands are far younger than the storied maisons of Swiss or German watchmaking that comprise the majority of brands found in the large luxury groups. These younger brands last week could be found displaying their wares with the Carré des Horlogers, an area within the SIHH dedicated to independent brands. Before we focus on the 2017 debuts from within this group, don’t forget that three larger brands, Roger Dubuis, Richard Mille and Ulysse Nardin, all now with luxury group backing, also practice within the realm of the contemporary, and each also debuted notable timepieces last week. We showed you Richard Mille’s latest cutting-edge debut, the RM 50-03 Tourbillon Split Seconds Chronograph Ultralight McLaren F1, in a previous post. Like Richard Mille, Ulysse Nardin also creates timepieces with non-traditional materials. The brand pioneered many aspects of silicon watch component manufacturing and notably developed the first application of diamond-based movement parts in the Freak Diamond Heart, which debuted in 2005. Innovision 2, Ulysse Nardin’s latest iteration of the Freak, debuted last week as Ulysse Nardin displayed its wares for the first time at SIHH. 1. Dual Constant Escapement (a sophisticated constant force escapement). 2. Direct silicon bonding to meld two escapement parts into one. 3. A silicon balance wheel with gold mass elements and stabilizing micro paddles. 4. A self-winding mechanism called a ‘grinder." 5. A sapphire-coated silicon bridge. 6. 24-karat hard gold wheels. 7. A glass bridge with integrated shock protection for the balance wheel. 8. SuperLumiNova-filled channels integrated into the glass balance wheel bridge. 9. An unusual 1 – 11 and 13 – 23 digital time display. 10. Three-dimensional glass minute hands. 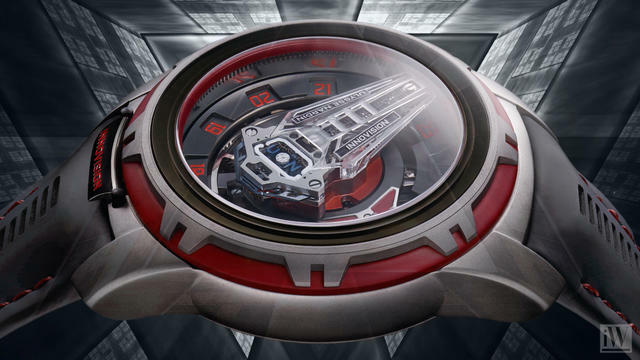 As Innovision 2 is a concept watch, the two existing models are not for sale. 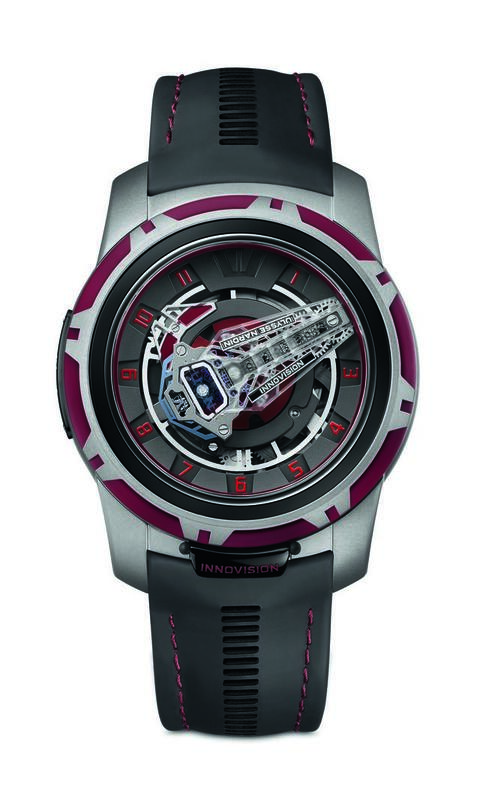 But expect Ulysse Nardin to utilize many of the techniques developed for the Innovision 2 in other Ulysse Nardin watches in the future. After all, most of the breakthroughs first seen in Innovision 1 can now be found in various Ulysse Nardin watches currently in its collection. 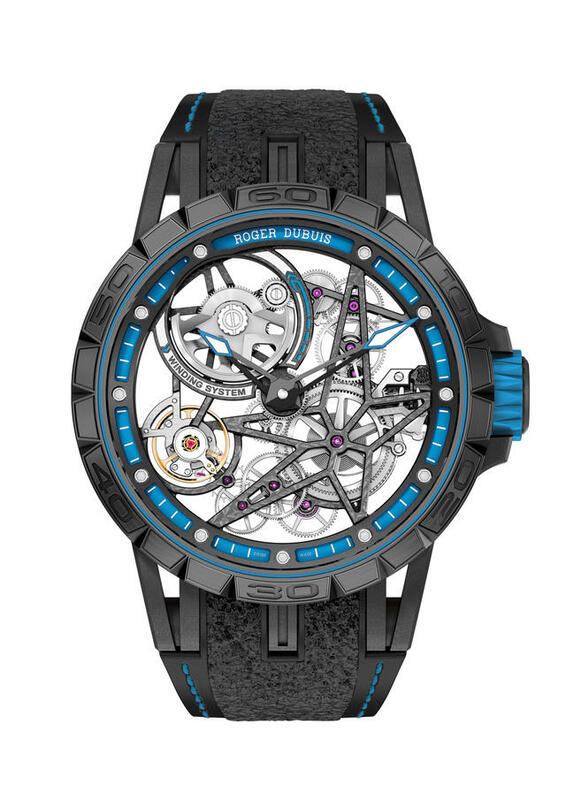 While Roger Dubuis retains more traditional mechanical watch techniques throughout its tourbillon-loaded, highly skeletonized collection, the brand’s new Excalibur Quatuor Cobalt Micromelt introduces a high-performance cobalt chrome alloy to the watch industry. As iW noted a few weeks prior to the SIHH, Roger Dubuis has forged a case, bezel, caseback and crown of its eccentric Quatuor using the material, which the firm dubs MicroMelt technology. The alloy, used in aerospace technology and in astronomy, is 100% biocompatible, corrosion-resistant and extremely durable. 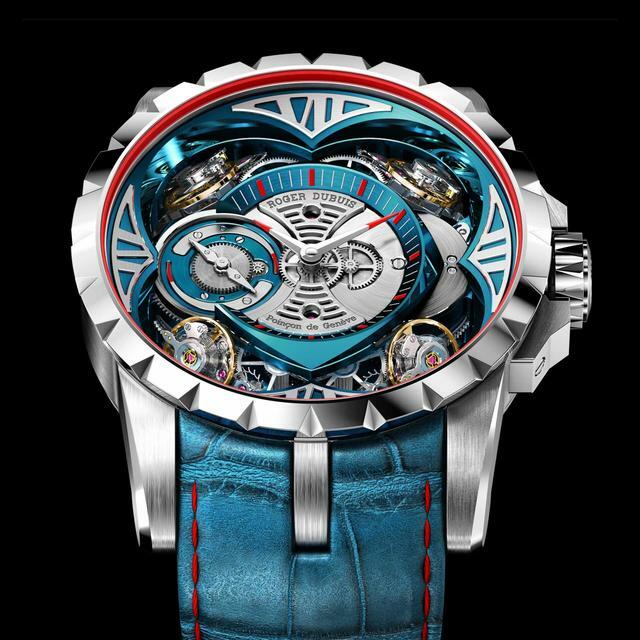 When this material is combined with the four-balance, five-differential high-speed Quatuor movement, the watch takes on a blue caste with red accents that, like the Ulysse Nardin Freak, mimics no other timepiece. Roger Dubuis this year has also teamed with tire-maker Pirelli for elements of its Excalibur Spider Pirelli Double Flying Tourbillon and Excalibur Spider Pirelli Automatic Skeleton. The strap of both watches featuring rubber inlays from certified Pirelli winning motorsport tires. Each strap is also adorned with treads that mimic those of a Pirelli Cinturato tire. The Double Tourbillon sports a sturdy 47mm black DLC titanium skeleton case that boasts vulcanized blue rubber accents around its titanium crown and case. The non-tourbillon Automatic Skeleton version is made using the same Pirelli blue hue. 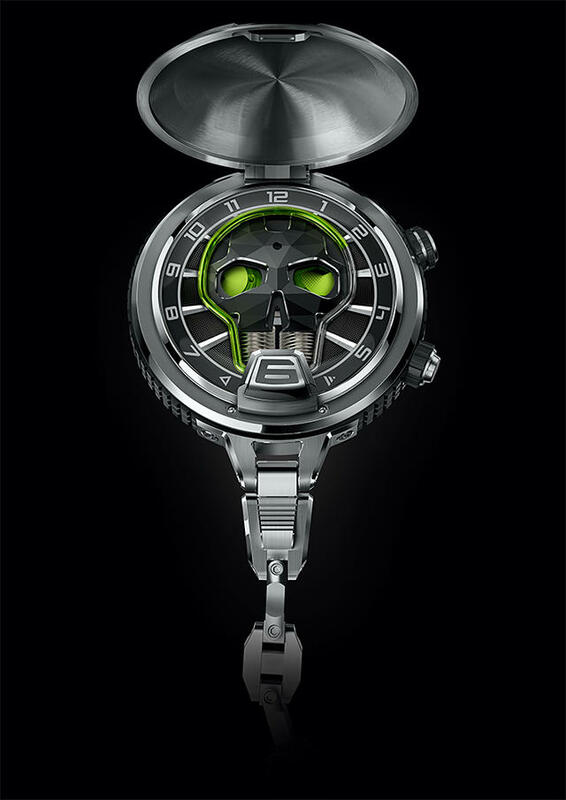 HYT, known for its hydro-mechanical horology, debuted its first-ever pocket watch, the Skull Pocket. The time can be read intuitively around the circumference of the skull via indices with Arabic numerals filled with SuperLuminova. The seconds are displayed in the left eye and the power reserve in the right eye. 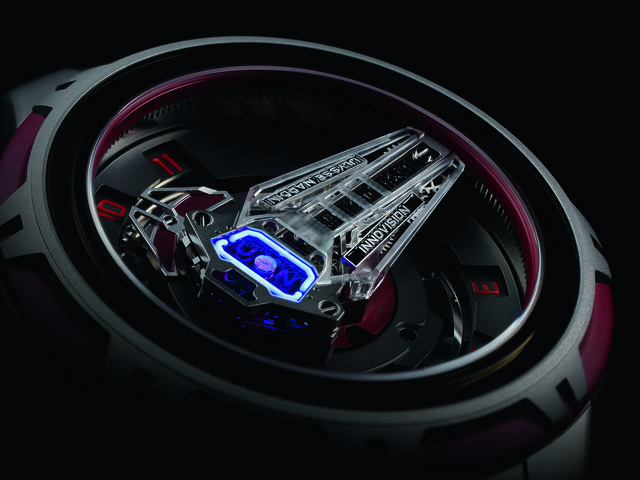 Interestingly, HYT has also added the same LED light technology that bathed its Metropolis with a blue hue. HYT has combined that same module here underneath the rider at 6 o'clock. The micro-generator that activates the lights has been integrated into the case and operates by converting mechanical power into electricity. Here’s how it works: A barrel spring is loaded when the dedicated push-button crown at 4:30 is turned. Pressing this push-button crown then releases the spring and turns the micro-generator at very high speeds, creating the electricity needed to activate the two LEDs. This bathes the Skull Pocket in a soft blue light, and gives the green liquid its fluorescent glow. The light lasts for around five seconds, after which the mechanism needs to be re-started, explains HYT. No batteries required. The 59mm by 20.6mm titanium-cased $115,000 Skull pocket will be made in a limited edition of eight. 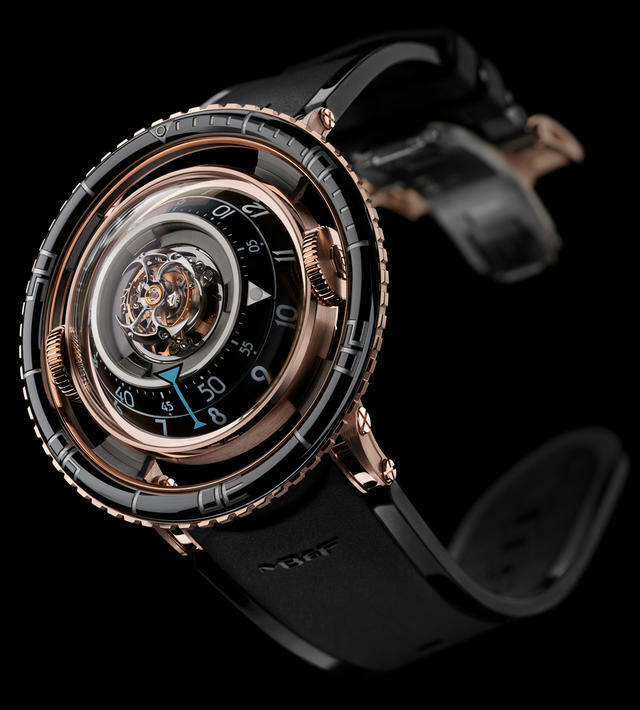 MB&F last week introduced its HM7, known as the Aquapod, and this mechanical jellyfish for the wrist quickly became one of the show’s most-discussed timepieces. The 53.5mm x 20mm watch is surprisingly comfortable on wrist due to its lightweight titanium construction, though the red gold model is somewhat heavier. 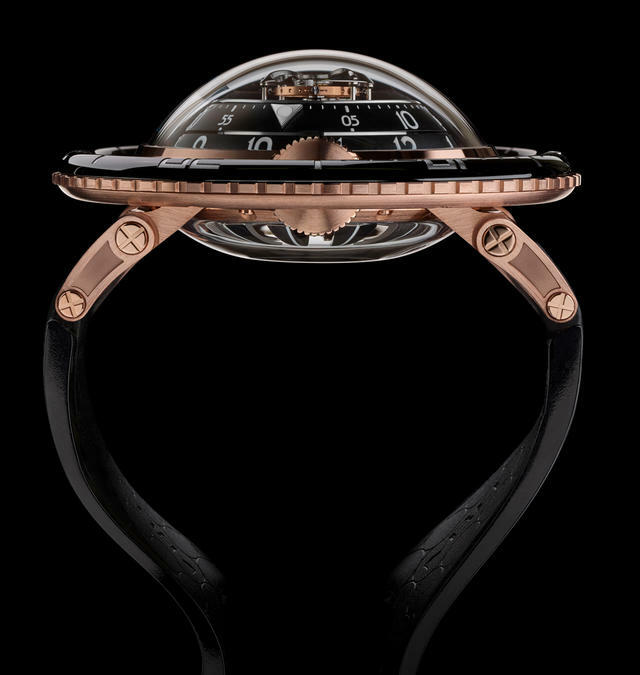 The Aquapod features a vertically arranged movement with, from bottom to top, the winding rotor, mainspring barrel, hour and minute indications, and flying 60-second tourbillon, all concentrically mounted around the central axis. Hours and minutes are displayed by two spherical segment discs in aluminum and titanium, which are supported by specially developed oversized ceramic ball bearings. 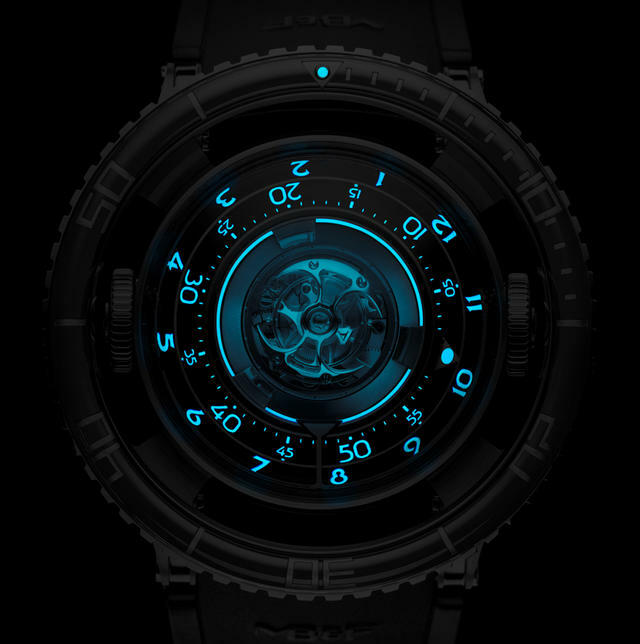 An extra dollop of high-powered AGT Ultra lume around the flying tourbillon and SuperLuminova markers and numerals make reading the Aquapod simple in the dark and at the same time mimic the glow of a jellyfish. Interestingly, the watch’s bezel is well outside its dual crowns. MB&F is launching the watch in grade-5 titanium with blue bezel (33 pieces, $98,000) and in red gold with a black bezel (66 pieces, $118,000). International Watch will feature more about SIHH 2017 debuts in future posts, and during the upcoming weeks will post timepieces expected to debut at the upcoming Baselworld, scheduled to begin in late March.